In the Scratch race Charlotte and Kirsten made it very exciting for us. With 13 laps to go Charlotte was in a breakaway that even the announcers thought would hold all the way to the finish. But the bunch behind wanted it differently and caught the group with just a few laps to go. 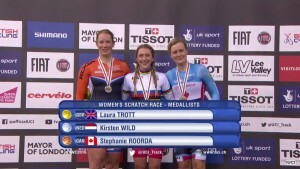 Kirsten finished strong but Laura Trott (GBR) proved the strongest in her home arena in London and won the race ahead of Kirsten in second and Stephanie Roorda (CAN) in third. In the omnium Saturday Simona did a great job finishing 2nd in the first race of the event, Scratch, where Kirsten finished 7th. 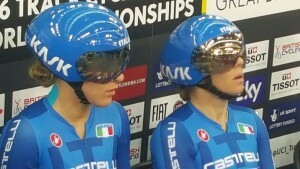 Before the 6th and last event of the omnium, Kirsten held on to the 7th place and Simona 9th. At 40points behind to the podium, the only chance for the girls was to go for points by taking laps on the peloton. Kirsten managed to get one lap and a sprint on the way, but it would prove difficult to gain more laps for points needed. 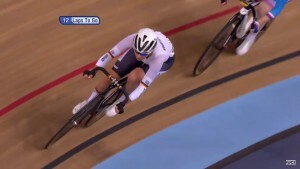 Kirsten finished the omnium at 7th and Simona 12th. The Omnium gold went to Laura Trott (GBR) ahead of Laurie Berthon (FRA) and Sarah Hammer (USA).